The decades around 1900 were crucial in the evolution of modern medical and social sciences, and in the formation of various national health services systems. The modern fields of psychiatry and mental health care are located at the intersection of these spheres. There emerged concepts, practices, and institutions that marked responses to challenges posed by urbanization, industrialization, and the formation of the nation-state. These psychiatric responses were locally distinctive, and yet at the same time established influential models with an international impact. In spite of rising nationalism in Europe, the intellectual, institutional, and material resources that emerged in the various local and national contexts were rapidly observed to have had an impact beyond any national boundaries. In numerous ways, innovations were adopted and refashioned for the needs and purposes of new national and local systems. 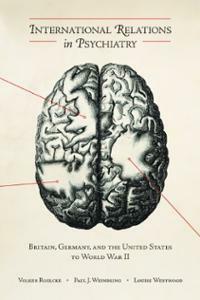 International Relations in Psychiatry: Britain, Germany, and the United States to World War II brings together hitherto separate approaches from the social, political, and cultural history of medicine and health care and argues that modern psychiatry developed in a constant, though not always continuous, transfer of ideas, perceptions, and experts across national borders. Contributors: John C. Burnham, Eric J. Engstrom, Rhodri Hayward, Mark Jackson, Pamela Michael, Hans Pols, Volker Roelcke, Heinz-Peter Schmiedebach, Mathew Thomson, Paul J. Weindling, Louise Westwood Volker Roelcke is professor and director at the Institute for the History of Medicine, Giessen University, Germany. Paul J. Weindling is professor in the history of medicine, Oxford Brookes University, UK. Louise Westwood is honorary research reader, University of Sussex, UK. This is a repost from http://histoiresante.blogspot.ca. You will find the original post here. This book was published in 2010; April 2013 is merely the paperback release date. I hope that the book cites a relatively unknown compilation by Ladislas Farago that demonstrates the social psychological appropriation of Nazi or German methods of mind-management that I summarized here in four parts: http://clarespark.com/2010/04/18/links-to-nazi-sykewar-american-style/. “Links to Nazi sykewar American style.” Leading progressives were supportive of this appropriation, including Dr. Henry A. Murray of Harvard.